Before the advent of expensive, boundary-pushing graphics technology, any monitor was a gaming monitor. The best gaming monitor didn't exist because display makers didn't cater to gamers, specifically. Instead, they relied on a catch-all approach to designing and manufacturing general purpose computer monitors, whose function served everyone from engineers to copywriters to designers to – yes, video game players. Today the landscape is vastly different. Largely due to the widespread popularity of selling things online, monitor companies can now justify developing use case-specific displays. Hence, the birth of the gaming monitor. These days, the best gaming monitor takes various forms. You can find a "simple" 4K 60Hz panel at a relatively low cost. Needless to say, the barrier of entry for 4K gaming at 60fps is a lot lower than what it once was. But, of course, new tech has been introduced, supplanting the gold standard of yesteryear. HDR, for instance, has found its footing in not only the PC realm, but in PS4 and Xbox One revisions as well. Hardware-based adaptive sync technologies like G-Sync and FreeSync are burgeoning in popularity, too. If money is no object, you can eliminate input lag, microstuttering and screen tearing at the click of a "Buy Now" button. Like all those godforsaken hindrances, though, budgetary constraints are pesky and oftentimes detrimental to all things fun and good. So with that in mind, we've tested every screen we could get our hands on before narrowing our list down to 10 and recommending only the best of the best gaming monitors for your text-based enjoyment below. That said, we cannot stress enough the importance of frugality when perusing gaming hardware. Every penny counts. As such, we've made sure our picks are as impressive in terms of value as they are regarding specs. Should FreeSync and G-Sync come at a cost that comes largely unjustified to you, other factors to look out for as you set your sights on the best gaming monitor are aspect ratio and viewing angle. Most gaming monitors now offer in-plane switching, or IPS, panels. Compared with the twisted nematic, or TN, displays of the past, IPS screens have much better viewing angles and color reproduction. That said, competitive gamers who care more about performance than visual fidelity still find TN monitors enticing because of their faster, often 1ms response times. A similar sentiment applies in the resolution department, where 4K monitors exist alongside those with somewhat lower pixel densities yet higher refresh rates. If you find yourself kicking back exploring the vast open world of Assassin’s Creed Odyssey’s ancient Greece more often than sniping your friends in Overwatch, then 4K HDR inhabits the best gaming monitor of your future. Esports athletes, on the other hand, ought to peep the 120Hz or even 144Hz speed demons we’ve scouted out. Whatever the case, the best gaming monitor is here on this page – and thanks to the advent of HDMI, all are compatible with your PC, PS4, Xbox One and Switch. If you need more advice, here's our best gaming PC guide for 2019, and our look at the best gaming TVs. The PG279Q houses an IPS LCD panel capable of a maximum resolution of 2560X1440 at 165Hz. Color depth and gamma quality are excellent, as is to be expected of a high-end IPS panel, though reviewers (both consumer and press) disagree as to whether the PG279Q requires extensive calibration in order to achieve the best picture quality. The PG279Q’s G-Sync support is appealing but, like the Acer Predator XB271HU, only works if you’ve got an Nvidia graphics card installed, which is a bothersome limitation that might tempt you to look elsewhere. Nvidia’s customary G-Sync premium applies to the PG279Q, resulting in a price tag on the wrong side of $700, which is more expensive than many of the computers that’ll be paired with the monitors in this guide. It also isn’t anywhere near as pricey as 4K displays can get, if you can believe it, so while still very expensive, it’s a cheaper option for those who aren’t bothered about the 4K experience. All things considered, the Asus ROG Swift PG279Q is an exceptional monitor that’s just about worth the steeper price range compared to the next jump up in visual hardware. When you're an aspiring esports legend who wants it all, few monitors meet that criteria quite like the AOC Agon AG273QCG. A 27-inch curved monitor surrounded by razor-thin bezels and a clear-as-day 1440p resolution, you'd expect the boasts to start and end there considering the price. But you'd be wrong. It also packs 400 nits of brightness, and it's certified for VESA DisplayHDR 400, so it's plenty colorful and vibrant enough to depict colors as they appear in real life. For flashy, stylized esports like Overwatch, this can prove useful for spotting opponents as well as for simply admiring the beauty of the artwork the developers have poured their hearts and souls into creating. We mention esports, specifically, because competitive gamers are the obvious target audience for this display. Whereas single-player gamers tend to prefer IPS panels for their superior viewing angles, the Agon AG273QCG is a TN panel, designed for displaying games at buttery smooth high frame rates as a result of its 165Hz refresh rate. Effectively, this means the monitor "refreshes" 165 times every second, lending itself well to 165fps gaming. Assuming your gaming rig is up to the task, this is a fast and fluid monitor, with a nigh-instantaneous response time of 1ms. As Yoda would say, the next time you miss your shot, blame your monitor you will not. And that goes without mentioning G-Sync, which by itself adds a great deal of value to one of the best gaming monitors money can buy right now. The ZOWIE XL2430 combines an incredibly fast panel with fantastic blur reduction and a very high refresh rate, making it ideal for those seeking a low-latency/high-FPS solution for competitive gaming, or anyone who wants a great gaming monitor at a reasonable price. The former will especially appreciate the XL2430’s 1ms response time and 144Hz refresh rate, which translate to extremely low input lag and the ability to display up to 144FPS, provided your GPU is up to the task. It also features genre-specific presets, a nifty handheld remote for changing the settings and a handful of other smart conveniences. Since the XL2430 uses a TN (Twisted Nematic) LCD panel, its viewing angles aren’t quite as good as the other monitors found on this list. The XL2430 also tops out at 1920 x 1080, which most modern machines can push past while still maintaining playable frame rates. The trade off, then, is in price and capability -- that TN panel keeps costs reasonable and the refresh rate at 144Hz. It also allows BenQ to cram in useful extras, like their superb motion blur reduction technology. The only thing that could reasonably improve the XL2430 is AMD FreeSync support, but given the price and how good the panel is otherwise, we can’t really complain. It's not every day you find a 4K HDR display for less than half a grand, but the BenQ EL2870U is a bountiful exception and a pleasant surprise. While the viewing angles of its TN panel leave something to be desired, it boasts a shocking wealth of functionality typically found outside a budget monitor's wheelhouse. For instance, unlike the vast majority of even the best gaming monitors, this one has built-in speakers. They're unremarkable, but they are there for those times you want to share an epic gaming moment with a friend in the same room, audio included. Better yet, there's a headphone jack to ensure you never have to scramble for a cable long enough to reach your motherboard. If you have an AMD graphics card, the BenQ EL2870U is enhanced with native FreeSync support. Sadly, however, it is not G-Sync Compatible – trust us, we tested it. That said, it does have a utilitarian selection of ports, namely two HDMI 2.0 connections and a single DisplayPort 1.4. And, should you spend hours on end trying to best your KDR in Apex Legends, Ben-Q's integrated eye-care solution automatically adjusts brightness and blue light to safeguard your eyes from the evils of light-emitting diodes. It's not perfect, but the fact that this 28-inch 4K HDR screen regularly goes on sale for a fraction of its sticker price is a compelling case for snatching one up. The Acer Predator XB271HU is the Nvidia user’s answer to the Asus MG279Q, and it features many of the same benefits: a vibrant, flicker-free IPS panel with 144Hz refresh, excellent viewing angles and built-in screen tear prevention technology. Like AMD’s FreeSync, Nvidia’s G-Sync lets the GPU and monitor coordinate their efforts, reducing or eliminating screen tearing. Unlike FreeSync, which is part of the DisplayPort 2.1a standard and is free to include in any applicable monitor, G-Sync requires a proprietary Nvidia chipset in the display, which usually incurs a $200 premium over comparable monitors equipped with FreeSync, and even more versus monitors with no adaptive sync support. The upside is that since Nvidia has total control over the standard and its implementation, there’s greater assurance that a G-Sync monitor will work as advertised, while FreeSync quality can vary between manufacturers and from model to model. G-Sync monitors also tend to support a wider range of applicable refresh rates, as well as better anti-ghosting than FreeSync monitors. True to form, the Predator XB271HU is G-Sync capable between 30 and 144Hz out of the box, up to a maximum of 165Hz if you’re the overclocking type. Most modern computers, even the kind you buy a $700+ monitor for, can’t render a steady 144+ frames-per-second, so right now that much G-Sync headroom isn’t especially useful. As an investment, however, the Predator XB271HU makes a strong argument, as it’ll graciously provide for not only your current GPU, but the next couple of upgrades as well. Alienware is a household name in PC gaming, so you know you’ll be the getting the good stuff when it comes to the company’s line-up of bespoke monitors. The AW2518HF is a particularly enticing option, with a focus on exceptionally fast response times and refresh rates which comes at a forgivable cost of visual resolution. That aforementioned refresh rate comes in at an impressive 240Hz, making the AW2518HF perfect for competitive gaming with consistently smooth imaging that rarely buckles under pressure. But the drawback is the TN (Twisted Nematic) technology panel, which doesn’t allow for G-sync support and only offers full HD resolution. It still plays fast and smooth for what you’re paying for, though, and the AW2518HF’s gorgeous, expressive design build is ergonomically robust to ensure a safe and comfortable viewing experience at all times. It even comes rigged up with the AlienFX RGB LED lighting, which can be synced up to whatever’s playing on the screen, as well as the rest of your AlienWare hardware. With the steady march of GPU progress and the burgeoning UHD-capable gaming console market, springing for a 4K monitor might make perfect sense in some cases. Maybe you already own a UHD blu-ray player, or have your eye on a PlayStation 4 Pro. Perhaps you’re running dual Radeon 480s in CrossFire, or for some reason you need to display four unique inputs simultaneously on the same monitor. Provided that you have the means to invest in 4K right now, that you want to prioritize 4K over maximum FPS, and your high-end PC is equipped with an AMD GPU, the ViewSonic XG2700-4K is the monitor for you. 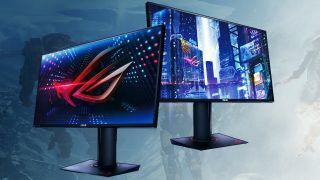 You’re giving up the ASUS MG279Q’s 144Hz refresh rate in exchange for the resolution bump to 4K, but chances are very good that 60Hz will be more than enough for games at 4K, at least for the immediate future. The ViewSonic XG2700-4K is FreeSync enabled, which will help keep those 4K games from tearing, provided your computer can render a steady 40+ FPS at that resolution. That’s no small feat, even with modern GPUs running in tandem, so PC-only gamers that aren’t on the absolute bleeding edge are heavily encouraged to opt for the comparatively priced ASUS MG279Q. Speaking of price, the only real downside to the XG2700-4K is the fact that it’s more expensive than LG and Samsung’s FreeSync-enabled 4K IPS displays. It’s also a lot newer, and given the overall responsiveness and clarity of the panel, we find the XG2700-4K’s entry fee understandable, albeit a bit of a bummer. One look at the Samsung CHG90, and you’ll probably know whether it’s the monitor for you. With an ultra-wide, love it or hate it 49-inch screen, the CHG90 wields a 32:9 aspect ratio across a curved display designed to envelop you ever further into its crisp imagery. You can set up the monitor so that it displays one super large image, great for enjoying high-end games at cinematic quality, or you can instead split the screen into two 16:9 displays, equally useful for those times when you want to browse the internet or watch something else as you play. You can even set up two different computers running as two split screens on the monitor, which is handy for users with separate work computers and entertainment systems. It’s easy to set up any of these options, too, and the screen itself is an undeniably jaw dropping visual treat, but that comes with an equally jaw dropping price tag. The processing power is nothing to be sniffed at either, mind you, with a 144Hz refresh rate and QLED technology that gives it an edge against similarly high-priced competitors on the market. Make no mistake, the CHG90 is a luxury product, but it lives up to that luxury in almost every sense of the word. Another curvy bit of eye candy for you, this time from the fine folks at Alienware. This one is a more compact option for widescreen fans, with 34 inches of pixels. This monitor's secret weapon is that is it can be overclocked to a 120Hz refresh rate, which puts in ahead of some of its cheaper rivals. Add to that its 100Hz refresh rate and G-Sync technology, which offer high frame rates without screen tearing, and Alienware is making sure you get plenty of bang for every buck you're putting into it. The monitor also gets a nod for keeping it classy on the design front. Think corporate super villain minimalism, with a ultrathin three-sided bezel and a stand that doesn't dominate your desk space. Yes, this is a pricey option, and won't be for you unless you're going to be playing games that really require ultra fast speeds. But if you want smooth, high-frame-rate games and a suite of game-specific features, the Alienware AW3418DW is worth the credit card debt. Piggybacking on the trend of number soup as a name, you probably won't remember what to call the Philips Momentum 435M6VBPAB, but that's not to say it's forgettable by any means. In fact, this 4K HDR monitor is one of the few displays on the market that'll likely get confused for a TV due to its tremendous 43-inch size. That's not huge for a TV, of course, but we expect our PC screens to fit on our desks. This one barely fits that bill, though it is a sturdy fella. Although it weighs around 30 pounds in total, you can count on the Momentum not to collapse amid your daily stumblings. From a technical perspective, the high price point – relative to a comparable TV set – is largely justified. It has all the makings of a competent desktop ornament. For one, it uses an MVA-type panel boasting a 4ms response time. Thus, latency is lower than what you would find on a common TV panel. The ports are different, too. While a big-screen TV in your living room might have a stack of A/V ports, a tuner, and a handful of HDMI ports, the Philips Momentum 435M6VBPAB takes a PC-first approach, sporting not only HDMI 2.0, but USB-C, DisplayPort, and mini DisplayPort as well. And perhaps most interestingly, the monitor has its own backlight that glows according to what's on screen. Philips calls this feature Ambiglow. Some online stores give us a small cut if you buy something through one of our links. Read our affiliate policy for more info.Some online stores give us a small cut if you buy something through one of our links. Read our affiliate policy for more info.